Smartphone is the most owned and most loved possession in today’s date. Every few month a new model hits the market with some added functionality and charms the people’s heart. A few years ago, a phone had merely got the functionality of making calls and sending messages but now it is a multi- tasking gadget. With the advancement in application development a phone has now become a smartphone. But still there are some feature that cannot be implement by software aid or any customized application. Sometimes additional hardware is also essential to provide a functionality. Now smartphones have always got a critical parameter of space and compactness so these functionalities need to be implemented using add-one. Take for instance a camera, though a camera provides many features to click your snap in a particular hue or tint but it cannot provide you thermal visibility. For that we have Seek Thermal attachment for your smartphone. 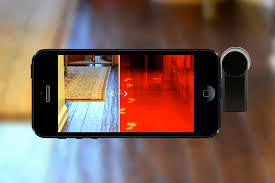 Now you can buy Seek Thermal’s smartphone attachment to transform your iPhone into an actual thermographic camera. 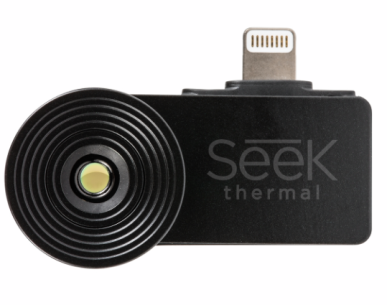 Seek Thermal is a thermal camera with a true thermal sensor that connects to your iPhone through the Lightning connection with a chalcogenide lens and vanadium oxide microbolometer. Your iPhone can detect heat and energy through darkness and physical surfaces, and not with fake filters or trickery. Beyond the novelty of having a heatseeking imaging camera strapped to your smartphone, the utility of the product is uncertain. The company says the device has many uses, from fixing blocked pipes (by seeing the liquid inside) to artistic photography (such as taking heat-mapped pictures of your food). The Seek Thermal cam will sell for $199 and it will be be available in micro USB and Lighting connector versions. This means it’ll work with any iPhone after the iPhone 5 and any Android device that runs Android 4.4.2 (KitKat) or above and supports USB host mode. In other words, Seek just released an affordable thermal camera accessory that works with just about any of today’s top smartphones. The Seek Thermal measures in at 2.75 x 84 x 0.84 inches, weighs 0.5 ounces and features a special True Thermal Sensor with 206 x 156 Array and 32,136 Thermal Pixels. While that might sound boring, the fact is the Seek Thermal camera might come in handy in a variety of situations where the user could learn more details about his or her surroundings by being able to check for heat dissipation. Operation is dead simple. All you have to do is plug the Seek camera into the micro USB port on your device (or Lightning connector for iPhones), and open up the app. The app uses your phone’s display as a viewfinder, and can even use your phone’s camera to give you a dual view image with visible-light and thermal views side-by-side. You can also set thermal thresholds, so that the camera will only show heat above, below or equal to a specified temperature. This makes it easy to highlight exposed skin or determine if your drink needs more ice.